With our reusable Shiplap Stencil you don't need to purchase and install real shiplap boards, or even put up a pricey shiplap wallpaper! You can just stencil your favorite farmhouse surface pattern in light grey or beige color using a dense foam roller for a simple but sophisticated effect. 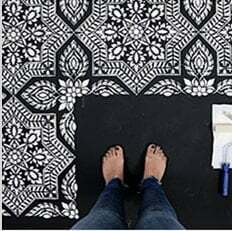 Just imagine the savings :) Perfect stencil pattern for modern farmhouse interior! For stencil repeat instructions please refer to the step-by step photos above. Our large stencils are expertly designed by professional decorative artists, so stenciling a wall with Cutting Edge Stencils is easy and intuitive. Please make sure you watch our instructional stencil Video Tutorials! You'll find them extremely helpful for your stenciling project. Even beginners get great results! Our wall stencils are expertly crafted in USA using most modern manufacturing methods and highest industry standards.